Avoiding pesticides is the reason why some people prefer organic food. Many believe that to be ecologically responsible food should be grown naturally. For others, the most important factor is the reassurance that the crop harvesting process did not expose farm workers to dangerous toxins. For many vegans, their main reason is to ensure that no chemical substances were used to grow their food that could cause the suffering and deaths of animals. However, at least for the time being, the majority of the food currently offered to consumers comes from a production system where animal exploitation – direct or indirect – is the standard, regardless of it being organic or not. To keep growing crops, organic farmers need to return organic matter and minerals to the soil, like all farmers do. To avoid using chemical fertilizing agents, organic farmers often opt for animal products such as manure, blood, and fish and bone meal to restore the mineral content of the soil, which tends to deplete due to farming. Many of them use a rotation system known as ‘crop and livestock,' where the animals themselves are being exploited. Whenever animals or animal derivatives are used, it presupposes exploitation of animals. Veganic farming (also termed “vegan-organic”) is based on the belief that having animals exploited or killed is not a prerequisite to growing food. Veganic farmers abstain from using synthetic chemical products, GMOs, slaughterhouse-originating byproducts or animal manures. The point that nonhuman animals are a required component of organic farming is moot: commercial farmers, individual farmers, even farms sponsored by the government have been growing their crops without using animals or their derivatives for years. In an 11-year study of veganic farming, where no animal manures were used to support crop yields, it was shown that competing insects and diseases posed no significant problems. Three different rotations of roots and cereals were used throughout the study. When animal manures would normally be used, farmers employed legume-derived green manures with nitrogen-replenishing properties instead. This study altered the perception of what it is to shift to organic farming. In the past, going organic meant replacing synthetic fertilizers with live animals; now, it is possible to shift to organic farming without needing to purchase and maintain livestock. As a consequence, a growing number of conventional farmers are shifting to veganic farming, which is good news for the environment as well as for nonhuman animals. Passing materials through animals to enrich the soil is an unnecessary process. From a physiological point of view, the only thing this process achieves is to waste energy which hinders its efficiency and sustainability as a food producing method. After all, there is nothing more in manure than the grains or grass already growing on the farm, simply passed through the animal’s digestive system. That doesn’t mean that vegan organic farmers don’t watch for diseases and competing organisms – all farmers do. 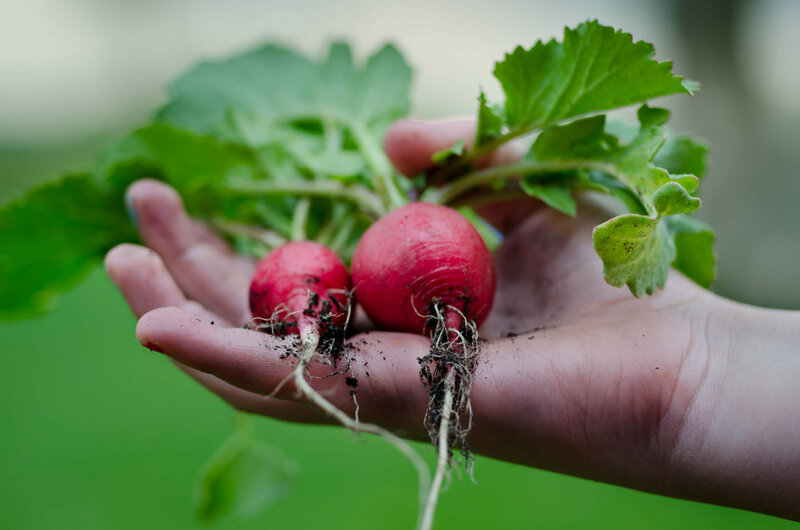 They do so, however, by completely avoiding the use of synthetic fertilizers or animals and their byproducts, choosing to help the soil develop a natural resistance. Veganic farming revolves around feeding the soil, which will, in turn, feed the crops. To keep the ground fertile, veganic farmers may use compost made from plant-derived material. They also employ crop rotation. This contradicts conventional farming, which is based on monoculture, the practice of growing single crops over extended areas of farmland. As time passes, monoculture has the tendency to reduce output and foster disease. It also results in land devaluation for a varied population of animals. On the other hand, vegan organic farmers enhance biodiversity ensuring a healthy balance of insects, predators, and useful organisms. By making sure that plant life and wintering animals have ample habitat, the natural balance is maintained for years to come providing for many growing seasons, as well as respecting the lives of other organisms that share their land with us. Composts used by vegan organic farmers and gardeners may come from grass cuttings, vegetable peelings, spent hops, old hay, garden waste, comfrey, ramial, and even seaweed. This compost is supplemented with green manures. These are plants that are grown and then cut down, either to be mixed with the soil or left on it to decompose naturally. Welcoming biodiversity and using disintegrating plant materials to grow crops is not a new concept. It’s where natural growth is based. Look at the forest, for example; its fertility is based on plants accumulating on the surface, without soil manipulation and the use of added animal manure. It was common knowledge among the ranks of early farmers. In fact, an entire period existed when no animal derivatives or animal manure was used for farming of any kind. An added benefit of avoiding the use of animals and their byproducts in modern farming practices is significant savings in fossil-fuels that are consumed in order to transport manure between places. Also, if no animals are present, maintaining vast pasture areas becomes obsolete, which means that these areas can become forests again. That is a win-win situation for animals, who also get their natural habitat back, besides not being exploited for our own purposes. Our food is closely connected with the natural world. In cases where we can choose, opting for particular farming techniques will undoubtedly affect animals' – human and nonhuman alike – survival in terms of food, space, and environmental health. For this reason, the support of organic farming has always been of great importance for the diligent consumer. Supporting vegan organics takes that diligence a critical step ahead. The methods used to turn duck and goose livers into the "delicacy" known as pâté de foie gras are anything but delicate. Foie gras is a French term meaning "fatty liver" and it is produced by force-feeding birds. The ducks and geese force-fed for foie gras are compelled to consume much more high-energy food—mostly corn—than they would eat voluntarily. This damages their liver and often kills them. Birds are routinely confined to small cages or crowded pens. Birds are force-fed tremendous amounts of feed via a 12- to 16-inch plastic or metal tube, which is shoved down their throats and attached to a pressurized pump. The force-feeding may be performed twice daily for up to two weeks for ducks and three to four times daily, for up to 28 days for geese. Force-feeding causes the liver to increase in size about 6-10 times compared to the normal size for a bird. Increased liver size forces the abdomen to expand, which makes moving difficult and painful. An enlarged abdomen increases the risk of damage to the stretched tissue of the lower part of the esophagus. Force-feeding results in accumulated scar tissue in the esophagus. The liver can be easily damaged by even minor trauma. Ducks and geese are social animals who suffer when confined in individual cages. The confinement also can lead to lesions of the sternum and bone fractures, as well as foot injuries from the cage floors. Ducks and geese also suffer when they're not allowed enough water to swim and preen, which they do naturally in the wild. Originally, all foie gras came from France, but now the United States has gotten into this cruel niche industry. Refrain from eating foie gras. The next time you go into a store or restaurant that sells foie gras, please let them know that a product that comes from force-feeding ducks and geese is more than you can stomach. Only pigs in movies spend their lives running across sprawling pastures and relaxing in the sun. On any given day in the U.S., there are more than 65 million pigs on factory farms, and 110 million are killed for food each year. Mother pigs (sows)—who account for almost 6 million of the pigs in the U.S.—spend most of their lives in individual “gestation” crates. These crates are about 7 feet long and 2 feet wide—too small to allow the animals even to turn around. After giving birth to piglets, sows are moved to “farrowing” crates, which are wide enough for them to lie down and nurse their babies but not big enough for them to turn around or build nests for their young. After they are taken from their mothers, piglets are confined to pens until they are separated to be raised for breeding or meat. Every year in the U.S., millions of male piglets are castrated (usually without being given any painkillers) because consumers supposedly complain of “boar taint” in meat that comes from intact animals. Piglets are not castrated in the U.K. or Ireland, and the European Union is phasing out the practice by 2018. In extremely crowded conditions, piglets are prone to stress-related behavior such as cannibalism and tail-biting, so farmers often chop off piglets’ tails and use pliers to break off the ends of their teeth—without giving them any painkillers. For identification purposes, farmers also cut out chunks of the young animals’ ears. Farms all over North America ship piglets (called “feeder pigs”) to Corn Belt states such as Illinois and Indiana for “growing” and “finishing.” When they are transported on trucks, piglets weighing up to 100 pounds are given no more than 2.4 square feet of space. Once pigs reach “market weight” (250 to 270 pounds), the industry refers to them as “hogs” and they are sent to slaughter. The animals are shipped from all over the U.S. and Canada to slaughterhouses, most of which are in the Midwest. According to industry reports, more than 1 million pigs die en route to slaughter each year. No laws regulate the duration of transport, frequency of rest, or provision of food and water for the animals. Pigs tend to resist getting into the trailers, which can be made from converted school buses or multideck trucks with steep ramps, so workers use electric prods to move them along. No federal laws regulate the voltage or use of electric prods on pigs. A typical slaughterhouse kills about 1,000 hogs per hour. The sheer number of animals killed makes it impossible for pigs’ deaths to be humane and painless. Because of improper stunning, many hogs are alive when they reach the scalding-hot water baths, which are intended to soften their skin and remove their hair. 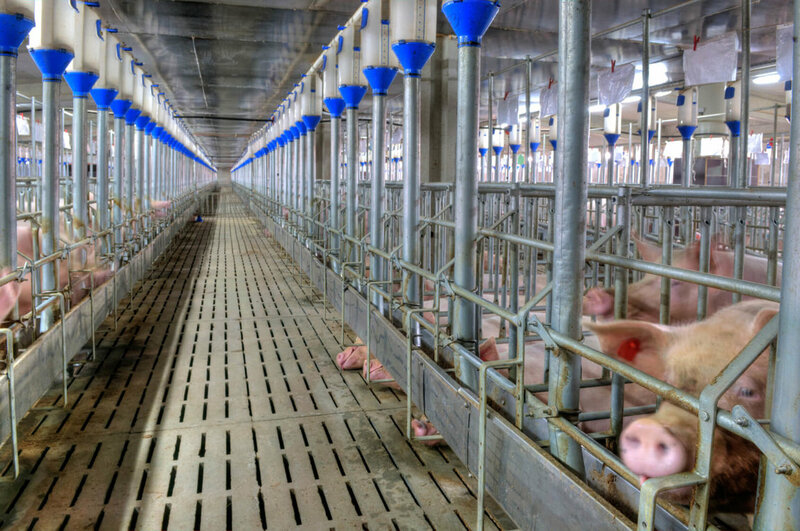 Because crowding creates an environment conducive to the spread of disease, pigs on factory farms are fed antibiotics and sprayed with huge amounts of pesticides. The antibiotics and pesticides remain in their bodies and are passed along to people who eat them, creating serious health hazards for humans. Pigs and other factory-farmed animals are fed 20 million pounds of antibiotics each year, and scientists believe that meat-eaters’ unwitting consumption of these drugs gives rise to strains of bacteria that are resistant to treatment. Each factory-farmed pig produces about 9 pounds of manure per day. As a result, many tons of waste end up in giant pits, polluting the air and groundwater. According to the Environmental Protection Agency, agricultural runoff is the number one source of pollution in our waterways. Stop factory-farming abuses by supporting legislation that abolishes intensive-confinement systems. Reduce or eliminate pork from your diet. 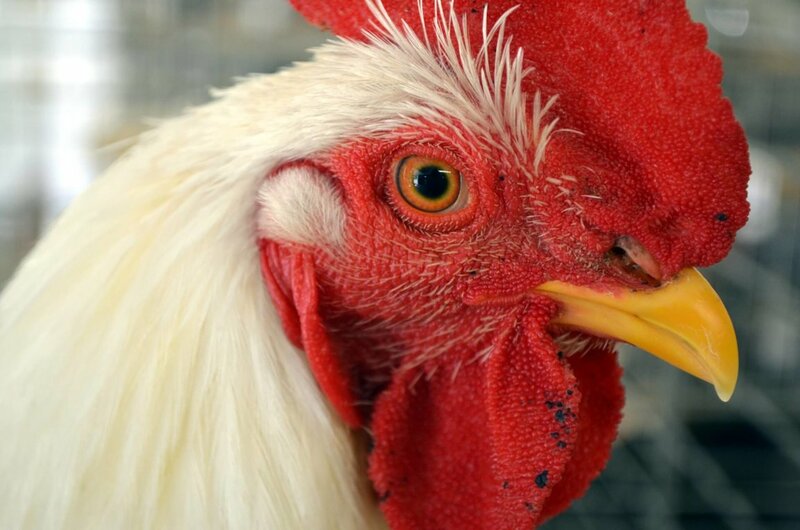 Chickens form strong family ties. A mother hen begins bonding with her chicks before they are even born. She will turn her eggs as many as five times an hour and softly cluck to her unborn chicks, who will chirp back to her and to one another. After they are hatched, the devoted mother dotes over her brood, teaching them what to eat, how to drink, where to roost, and how to avoid enemies. Male chickens (called roosters) are most famous for greeting each sunrise with loud crows, often acting as alarm clocks for farmers. Despite their reputation, pigs have many positive attributes including cleanliness, intelligence and a social nature. Pigs are indeed clean animals. Yes, they do roll in mud, but only because they can't sweat like people do; the mud (or water) actually keeps them cool. If available, pigs, who are excellent swimmers, prefer water to mud. Pigs also carefully keep their sleeping area clean, and will designate a spot as far from this area as possible for waste. Even piglets only a few hours old will leave the nest to relieve themselves. Pigs are vocal and communicate constantly with one another. More than 20 of their vocalizations have been identified. Pigs most often say "gronk" (more commonly known as "oink"), and will say "baawrp" when happy. They have an elaborate courtship ritual, including a song between males and females. Newborn piglets learn to run to their mother's voice, and the mother pig sings to her young while nursing. 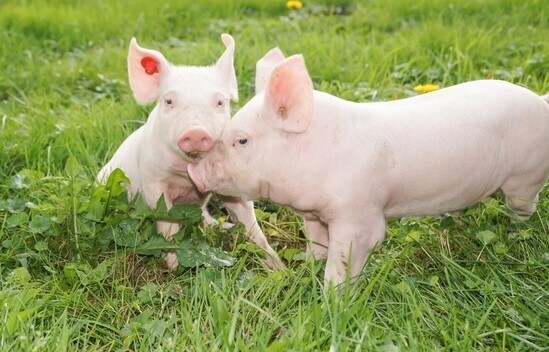 After nursing, a piglet will sometimes run to her mother's face to rub snouts and grunt. Pigs also enjoy music. The grunts made by pigs vary depending on the pig’s personality and can convey important information about the welfare of this highly social species, new research has found. Scientists specializing in animal behavior and welfare devised an experiment to investigate the relationship between personality and the rate of grunting in pigs. They also examined the effect different quality living conditions had on these vocalizations. To get a measure of the pigs’ personalities, the researchers conducted two tests: a social isolation test and a novel object test. Each pig spent three minutes in social isolation, and five minutes in a pen with a large white bucket or an orange traffic cone they had not previously encountered. Their behavior, including vocalizations, were observed. These tests were repeated two weeks later, allowing the researchers to determine if the pigs’ responses were repeatable – the defining characteristic of personality (also known as ‘coping style’ in animals). They also recorded the frequency of grunts they made by counting the number of grunts produced per minute of the test, and investigated the effect different quality environments had on the sounds made. 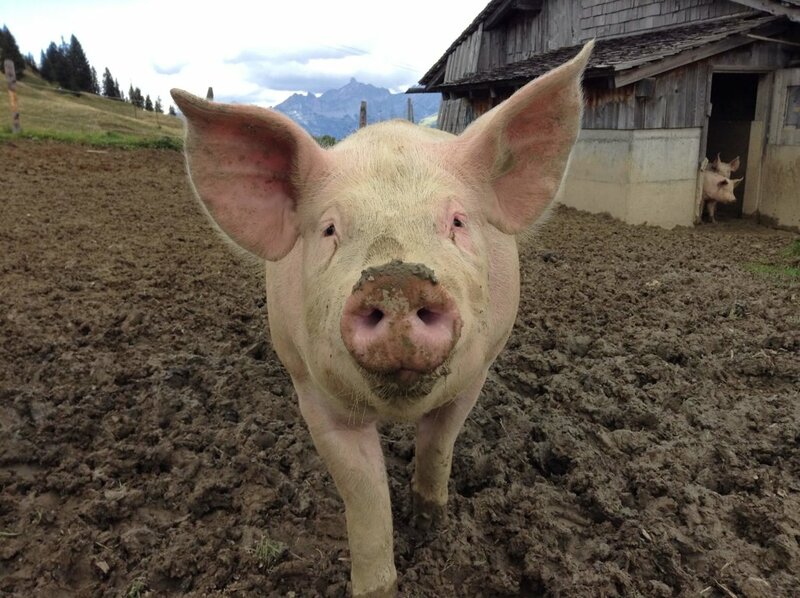 The results add to evidence that acoustic signaling indicates personality in pigs. This may have had far reaching consequences in shaping the evolution of social behaviors, the researchers believe. The findings also suggest personality needs to be kept in mind when using vocalization as a measure of the animals’ welfare status. As the animal agriculture industry continues to take over the Earth's landmass, species rich habitats are being quickly destroyed. A frightening one acre of land is cleared every second. Animal agriculture is the leading cause of species extinction, habitat destruction and ocean dead zones. Animal agribusiness already occupies about 40% of Earth’s landmass and accounts for 75% of global deforestation. The rapid destruction is causing species to disappear, negatively impacting the biodiversity of native ecosystems and furthering our path into the 6th mass extinction of all species on Earth. There are about 1.7 million documented species of flora and fauna. Over 86% of 10 million known species of flora and fauna have not been described or documented. The UN is reporting an estimate of up to 100 plant and animal species lost every day. Our planet is about 4.5 billion years old. Through its ancient lifespan, Earth has encountered a few mass extinctions. 5 to be exact: Ordovician (444 million years ago), Devonian (375 million years ago), Permian (251 million years ago), Triassic (200 million years ago), and Cretaceous (66 million years ago). Out of the billion years of our planet’s life, humans have only been here for around 6 million years. Of those 6 million years, the current human species (Homo sapiens) has been here only 200,000 years – with our current civilization a mere 6,000 years old. The industrialization of this civilization is only 200 years old, and in the last 500 years 1,000 species of animals have gone extinct. Presently, the rate of extinction is as high as 140,000 species each year. Massive destruction is occurring in countries with mega diverse habitats that are home to some of the largest number of species. In the Amazon, 3 quarters of the rainforest have been (and continue to be) cleared for both international and domestic animal agriculture companies. In the US, where 260 million acres of forests have been cleared, 1 in 5 animal and plant species are at risk of extinction. Animal agribusiness has also devastated our marine environments. Billions of animals are stripped from the ocean every year. The rapid rates of oceanic animal harvesting doesn’t allow species enough time to reproduce. The inability to recover their populations puts the planet at risk of fishless seas by 2048. The facts and statistics are clear. The animal agriculture industry is killing our environment and putting every species on this planet at risk of extinction. The animal agriculture industry’s pollution of our air, water and land, along with deforestation and soil degradation, all contribute to habitat loss and species extinction. Like a domino effect, a multitude of aspects is leading to the destruction of Earth’s biodiversity. Animal farming has become the greatest threat to the world’s plants and animals. The clearing of forests and rainforests for livestock pasture and feed crops is extinguishing Earth’s biodiversity, which allows life to continue in balance regardless of natural changes to the environment. It all begins with the choices humans make and put on our plates, and that is also where it can end. Livestock farming is only in demand because of human consumption. By making healthier food choices that are more plant based, we can put a halt and reversal to the destruction of our planet and its animals. A vegan eating pattern is a healthy, responsible and humane option for you, the planet and animals. 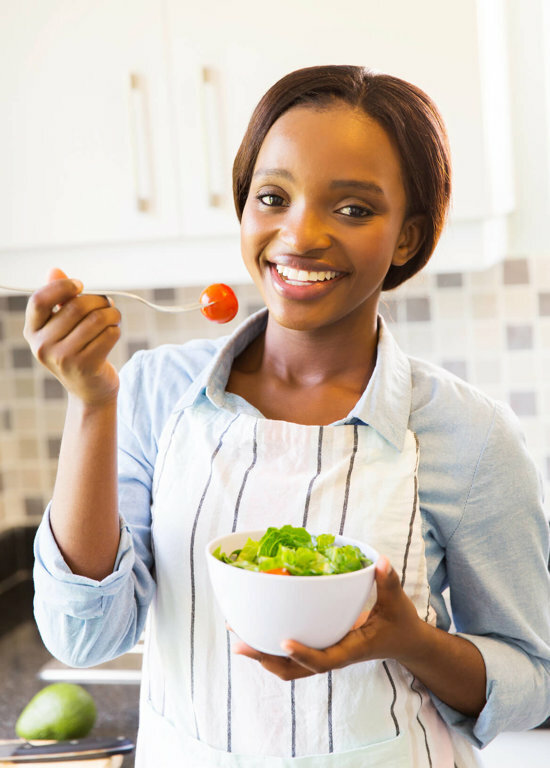 The key is to consume a variety of foods and the right amount of foods to meet your calorie and nutrient needs. Your protein needs can easily be met by eating a variety of plant foods. 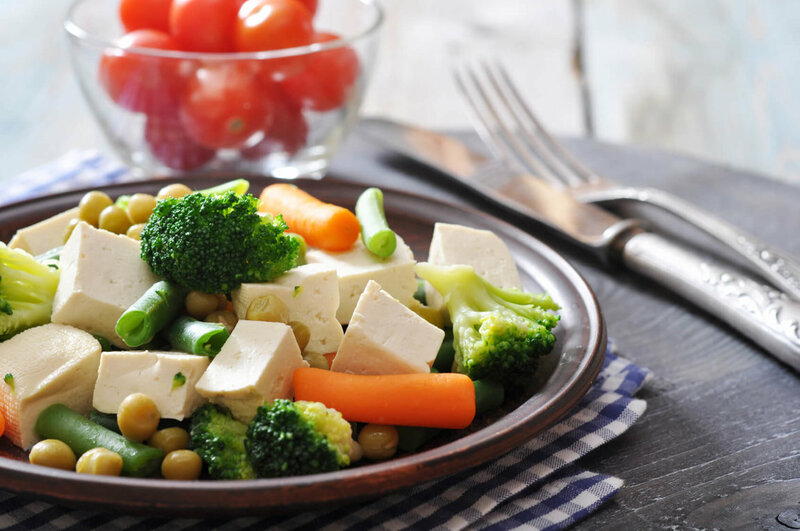 Sources of protein for vegans include beans and peas, nuts, and soy products (such as tofu, tempeh). Calcium is used for building bones and teeth. Sources of calcium for vegans include calcium-fortified soymilk (soy beverage), tofu made with calcium sulfate, calcium-fortified breakfast cereals and orange juice, and some dark-green leafy vegetables (collard, turnip, and mustard greens; and bok choy). Many popular main dishes are or can be vegan — such as pasta with marinara or pesto sauce, veggie pizza, vegetable lasagna, tofu-vegetable stir-fry, and bean burritos. Because of their high nutrient content, consuming beans and peas is recommended for everyone. Enjoy some vegetarian chili, three bean salad, or split pea soup. Make a hummus filled pita sandwich. A variety of vegan products look — and may taste — like their non-vegan counterparts but are usually lower in saturated fat and contain no cholesterol. For breakfast, try soy-based sausage patties or links. For dinner, rather than hamburgers, try bean burgers or falafel (chickpea patties). Most restaurants can make vegan modifications to menu items by substituting meatless sauces or nonmeat items, such as tofu and beans for meat, and adding vegetables or pasta in place of meat. Ask about available vegetarian options. Vegans can choose fortified foods such as cereals or soy products, or take a vitamin B12 supplement if needed. Check the Nutrition Facts label for vitamin B12 in fortified products. People become vegans for a variety of reasons, including conscience, health, ethics and even family tradition. Veganism has become increasingly popular, while research has been providing support regarding multiple benefits of a plant-based diet. Animals, humans, and the environment all benefit from it. Below are the ten most important reasons to turn to veganism. Vegan diets provide significant amounts of several vital nutrients such as minerals (iron, calcium, etc. ), vitamins, protein, and so on. Moreover, plant-based foods contain lots of fiber and are rich in antioxidants, while being low in saturated fat. This renders veganism ideal for fighting the majority of chronic conditions of the modern era, such as diabetes, hypertension, and obesity. A lot of today’s chronic diseases can be traced back to obesity. Vegan diets are highly effective for people wanting to shed off excess weight. When you remove dairy and meat from your daily diet, your saturated fat intake goes down. Research shows that overweight people that switch to a vegetarian diet low in fat may lose up to 24 pounds in the first year alone. Numerous studies have shown that vegans live longer than meat eaters by a large margin. Vegetarians and vegans live 3 to 6 years longer on average than their meat-eating counterparts. Switching to veganism from the typical American diet can result in a life extension of over 13 years. Meat, fish, eggs and dairy products are packed with cholesterol. By taking them out of your daily eating plan, you remove all the dietary cholesterol in one strike. 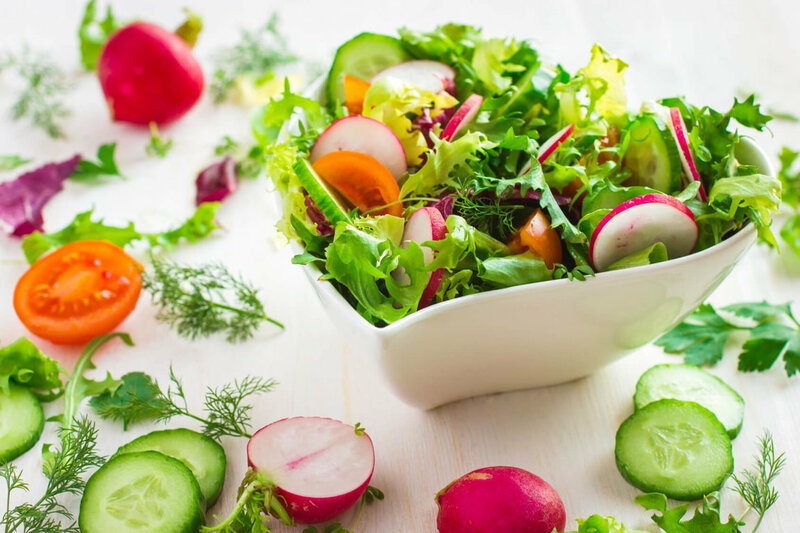 Switching to a well-balanced vegan diet is your best bet to avoid cardiovascular disease, the chronic condition that is responsible for more than 1 million deaths per year in America alone. Veggies and fruits are rich in several phytochemical compounds that bolster your body’s immune defenses. When your immune system is fed with the antioxidants and nutrients that come with a vegan diet, it becomes stronger – defeating conditions like cancer. There are several meat-borne illnesses that you steer clear of when you abstain from meat. Approximately 76 million people come down every year with a food-borne illness, of whom around 325 thousand end up in the hospital and almost 5 thousand die. The vast majority of these cases can be attributed to seafood, poultry, and meat. Your diet greatly affects the way you look. Most vegans enjoy a natural glow in their skin, and that’s not just by luck; fruits and veggies are behind this phenomenon. Removing meat from your daily eating habits cuts down blemishes, body odor, and foul breath. What’s more, your nails and hair also thrive on a vegan diet. The evidence is clear that no-meat diets drastically reduce environmental destruction. Animal farming is the number one cause of water consumption, pollution, and deforestation. Animal agriculture has a higher greenhouse effect on the atmosphere than fossil fuel consumption. What’s more, a significant amount of fossil fuel is consumed during transportation and processing of meat and dairy products, loading the atmosphere with unneeded carbon dioxide. The meat industry is the leading cause of rainforest destruction, soil erosion, habitat loss, species extinction and dead zones in the oceans. Vegan diets do much more good than just keeping you healthy and protecting the environment; your wallet will thank you too. Americans eat about 200 pounds of meat on average per year, making up for 10% of their total food budget. By replacing meat with plant-based food, your annual food budget will go down by approximately 4 thousand dollars. To be truly healthy, you need to be truly conscious. You will achieve peace of mind when you realize that you are protecting the planet and other sentient beings by simply resisting the urge to satisfy your gluttony! Deforestation causes drastic loss of tropical forest biodiversity, and most deforestation occurs due to animal agriculture. Remaining areas of undisturbed and recovering forest provide the last refuge for many species unable to withstand the impact of human activity. As one of the most comprehensive surveys of the impacts of disturbance on tropical forest biodiversity ever conducted, an international team of scientists found where forests had been cleared for animal agriculture, plant and animal life was impoverished and remaining species invariably consisted of the same subset of the original flora and fauna. There is irrefutable evidence that biodiversity is declining across the tropics due to animal agriculture. The rapid growth of animal agriculture is the leading cause of deforestation. 70% of the Amazon Rainforest has already been destroyed and is now occupied by pastures and feed crops. One of the main crops grown in the rainforest is soybeans used specifically for animal feed. 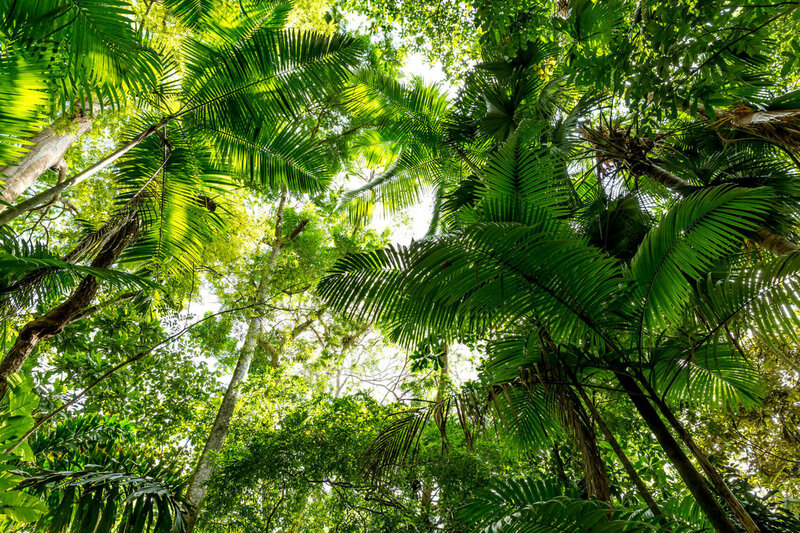 Tropical deforestation and forest clearing have adverse consequences that contribute to climate change, biodiversity loss, reduced timber supply, flooding and soil degradation. Deforestation through farming also has a major effect on species loss and simplification across large areas. The lower species diversity in degraded forests indicates that many species are restricted to undisturbed forests. And the way in which they are altered by human activity has an impact on which species survives. To preserve maximum species diversity, we must shift from animal-based agriculture to plant-based agriculture. Already 56 million acres of land are used to feed farmed animals, while only 4 million acres produce plants for human consumption. It takes 20 times less land to feed someone on a plant based diet than it does to feed meat eaters. Studies have also determined that reserves should not be concentrated in one part of a region, but as a widespread network of forest reserves. These should include secondary forests where no primary forests remain. While there remains a widespread assumption that concentrating conservation efforts on the protection of isolated reserves is the best way to safeguard biodiversity, areas of private land already disturbed – which dominate much of the tropics – need to be maintained and protected as a wide network of forest areas. Without such a landscape-scale approach, many species will go regionally extinct. The unsustainable ways in which we produce eggs, meat and dairy is damaging our environment. Switching to plant-based agriculture results in significant reductions in climate change, rainforest destruction and pollution of our air, water and land. Consumers who avoid meat for ethical and/or health reasons often still consider dairy foods nutritious and humane. But products made from cow's milk are far from "natural" for humans and anything but humane for cows and their calves. Cow's milk is suited to the nutritional needs of calves, who, unlike human babies, will double their weight in 47 days (as opposed to 180 days for humans), grow four stomachs, and weigh 1,100-1,200 pounds within two years. Cow's milk contains about three times as much protein as human milk and almost 50 percent more fat. No other species besides humans drinks milk beyond infancy, and no other species drinks the milk of another species (except domestic cats and dogs, who are taught the habit by humans). After four years of age, most people develop lactose intolerance, the inability to digest the carbohydrate lactose (found in milk), because they no longer synthesize the digestive enzyme lactase. Lactose-intolerant people who drink milk can experience stomach cramps, gas, and diarrhea. By some estimates, up to 70 percent of the world's population is lactose intolerant. In addition to being an unnatural food for humans, cow's milk, like other dairy products, is unhealthful. Dr. John A. McDougall calls dairy foods "liquid meat" because their nutritional contents are so similar. Rich in fat and cholesterol, dairy products, including cheese, milk, butter, cream, yogurt, and whey (found in many margarines and baked goods), contribute to the development of heart disease, certain cancers, and stroke our nation's three deadliest killers. Robert Cohen, author of Milk: The Deadly Poison, estimates that, by the time the average American is 50, he or she has consumed from dairy foods the same amount of cholesterol found in 1 million slices of bacon. Perhaps most surprisingly, the consumption of dairy foods has also been linked to osteoporosis--the very disease milk is supposed to prevent. Osteoporosis is a debilitating disease characterized by low bone mass and deteriorating bone tissue. Contrary to the protestations of the dairy industry, this bone loss is not halted or prevented by an increased calcium intake so much as by a drop in protein consumption. Indeed, after studying the diets of 78,000 American women over a 12-year period, researchers at Harvard University concluded that "it is unlikely that high consumption of milk or other food sources of calcium during midlife will confer substantial protective effects against hip or forearm fractures"; participants in the study who consumed more than 450 milligrams of calcium from dairy foods per day actually doubled their risk of hip fractures. Foods high in animal protein, such as meat, eggs, and dairy products, leach calcium from the body in order to buffer the acidic byproducts that result from the breaking down of the excess protein; this causes a net loss of calcium. Societies with little or no consumption of dairy products and animal protein show a low incidence of osteoporosis. Furthermore, Dr. McDougall notes, "Calcium deficiency caused by an insufficient amount of calcium in the diet is not known to occur in humans." Other illnesses are also more prevalent among those who consume significant amounts of dairy products than among vegans. Ninety percent of asthma patients who were put on a completely vegetarian diet (without meat, eggs, or dairy products) experienced great improvements in the frequency and severity of their attacks. According to the American Academy of Allergy, Asthma & Immunology, milk is the leading cause of food allergies in children, causing symptoms as diverse as runny noses, ear problems, muscle fatigue, and headaches. Dairy foods have also been implicated in congestive heart failure, neonatal tetany, tonsil enlargement, ulcerative colitis, Hodgkin's disease, and respiratory, skin, and gastrointestinal problems. At least half of the 10 million cows kept for milk in the United States live on factory farms in conditions that cause tremendous suffering to the animals. They do not spend hours grazing in fields but live crowded into concrete-floored milking pens or barns, where they are milked two or three times a day by machines. Milking machines often cause cuts and injuries that would not occur were a person to do the milking. These injuries encourage the development of mastitis, a painful bacterial infection. More than 20 different types of bacteria cause the infection, which is easily spread from one cow to another and which, if left unchecked, can cause death. In some cases, milking machines even give cows electric shocks due to stray voltage, causing them considerable discomfort, fear, and impaired immunity and sometimes leading to death. A single farm can lose several hundred cows to shocks from stray voltage. Large dairy farms also have a detrimental effect on the surrounding environment. For example, in California, which produces one-fifth of the country's total supply of milk, the manure from dairy farms has poisoned hundreds--perhaps thousands--of square miles of underground water, rivers, and streams. 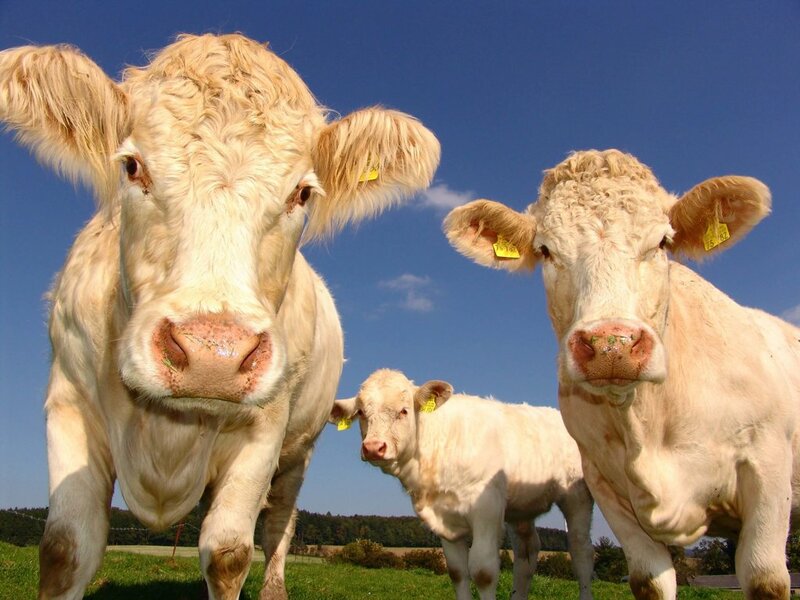 Each of the state's more than 1 million cows excretes 120 pounds of waste every day equal to that of two dozen people. Cows on today's farms live only about four to five years, as opposed to the life expectancy of 20-25 years enjoyed by cows of an earlier era. To keep the animals at high levels of productivity, dairy farmers keep them constantly pregnant through the use of artificial insemination. Farmers also use an array of drugs, including bovine growth hormone (BGH); prostaglandin, which is used to bring a cow into heat whenever the farmer wants to have her inseminated; antibiotics; and even tranquilizers, in order to influence the productivity and behavior of the cows. Many of the country's dairy cows are routinely injected with BGH, which manufacturers say increases a cow's production by 20 percent. That's not all BGH increases. According to the government warning that, by law, must accompany packages of the Monsanto company's BGH, the use of this hormone "has been associated with increases in cystic ovaries and disorders of the uterus" and may increase the number of cows afflicted with mastitis. The increased rates of infections in cows have led to an increase in the use of antibiotics at a time when scientists say the overuse of antibiotics has caused more and more strains of bacteria to become drug-resistant. Consumers Union, the publisher of Consumer Reports magazine, warns that higher infection rates in cows also mean more pus in the milk people drink. Some researchers also worry about the long-term effects of consuming milk from BGH-treated cows. For example, Dr. Samuel Epstein, a professor of environmental medicine at the University of Illinois School of Public Health, believes such milk could increase the risk of some types of cancer in humans. Perhaps the greatest pain suffered by cows in the dairy industry is the repeated loss of their young. Female calves may join the ranks of the milk producers, but the males are generally taken from their mothers within 24 hours of birth and sold at auction either for the notorious veal industry or to beef producers. If the calf is killed when young, his fourth stomach is also used in cheese-making; it contains rennin, an enzyme used to curdle (or coagulate) milk to turn it into cheese. Rennet, from whose membrane rennin is an extract, can also be used in this process. It is possible to make rennetless cheese (available at health food stores), but the close connection between the dairy, veal, and leather industries makes it cheaper for cheese producers to use calf parts than a vegetable-derived enzyme. Within 60 days, the cow will be impregnated again. For about seven months of her next nine-month pregnancy, the cow will continue to be milked for the fluid meant for her older calf. 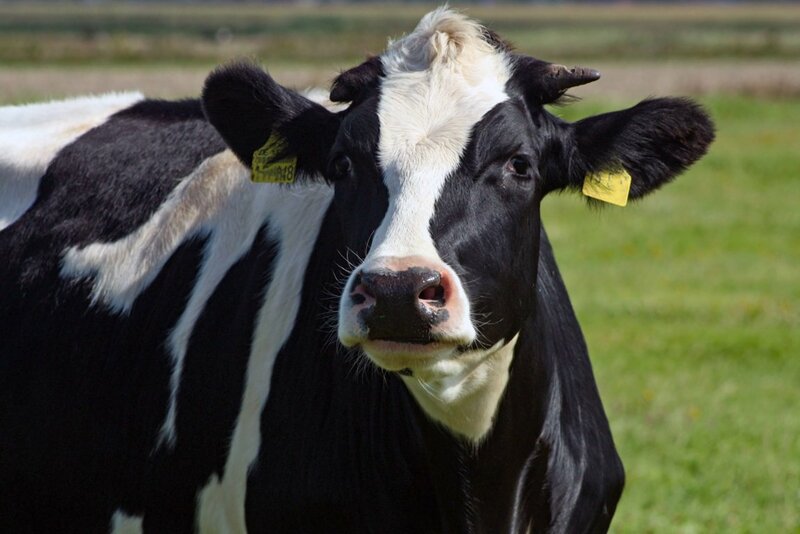 A typical factory-farmed dairy cow will give birth three or four times in her short life. When her milk production wanes, she is sent to slaughter, most likely to be ground up into fast-food burgers. Reduce or eliminate milk and dairy products from your diet. The food that people eat is just as important as what kind of cars they drive when it comes to creating the greenhouse-gas emissions that many scientists have linked to global warming, according to experts. Both the burning of fossil fuels during food production and non-carbon dioxide emissions associated with livestock and animal waste contribute to the problem. The average American diet requires the production of an extra ton and a half of carbon dioxide-equivalent, in the form of actual carbon dioxide as well as methane and other greenhouse gases compared to a strictly vegetarian diet. However close you can be to a vegan diet and further from the mean American diet, the better you are for the planet. Energy used for food production accounts for a large percentage of fossil fuel use. And the burning of these fossil fuels emits three-quarters of a ton of carbon dioxide per person. That alone amounts to approximately one-third the average greenhouse-gas emissions of personal transportation. But livestock production and associated animal waste also emit greenhouse gases not associated with fossil-fuel combustion, primarily methane and nitrous oxide. An example would be manure lagoons that are associated with large-scale pork production. Those emit a lot of nitrous oxide into the atmosphere. While methane and nitrous oxide are relatively rare compared with carbon dioxide, they are--molecule for molecule--far more powerful greenhouse gases than carbon dioxide. A single pound of methane, for example, has the same greenhouse effect as approximately 50 pounds of carbon dioxide. Vegan diets are the most energy-efficient. Fish and red meat are the least efficient. Research also indicates that plant-based diets are healthier for people, as well as for the planet. Swimming gracefully across a pond or waddling comically across the land, ducks are a common feature of the landscape of most of America. There are statues devoted to them in a park in Boston, and every year that city holds a parade for the Bostonian ducklings. Walt Disney created the sputtering Donald Duck, and Warner Brothers followed with a less feisty, yet still speech-impaired, Daffy Duck. Ducks are very social animals. Males and females sometimes live in pairs or together with their ducklings. They communicate both vocally and with body language. At other times ducks spend much of their time—during both day and night—in larger groups. The domestic duck has a normal life span of ten years. By contrast, a pair of geese will get together to raise a family and, for the most part, will stay together the rest of their lives (up to 25 years), raising new families each year. One of the most distinguishing characteristics of geese is that they form a giant "V" across the sky. This amazing trick actually helps each bird fly further than if flying alone. When a goose falls out of formation, she will feel the drag and move quickly back into formation to take advantage of the lifting power of the bird in front of her. When the lead goose gets tired, he rotates back into formation leaving another goose in the front position. They even honk to encourage those up front to keep up their speed. Geese have very strong affections for others in their group (known as a gaggle). If one in the gaggle gets sick, wounded, or shot, a couple of others may drop out of formation and follow the ailing goose down to help and protect him. They try to stay with the disabled goose until he dies or is able to fly again, then they catch up with the group or launch out with another formation. 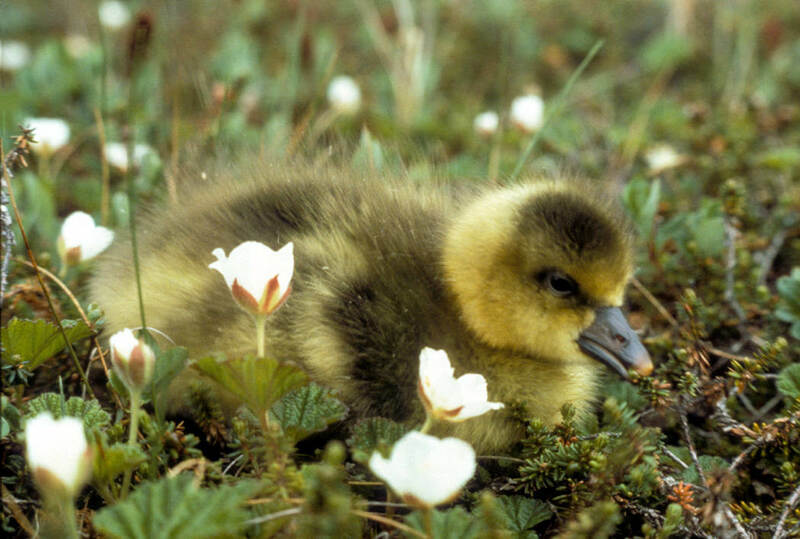 Much of a goose's time is spent foraging for food, most of which is obtained by grazing. 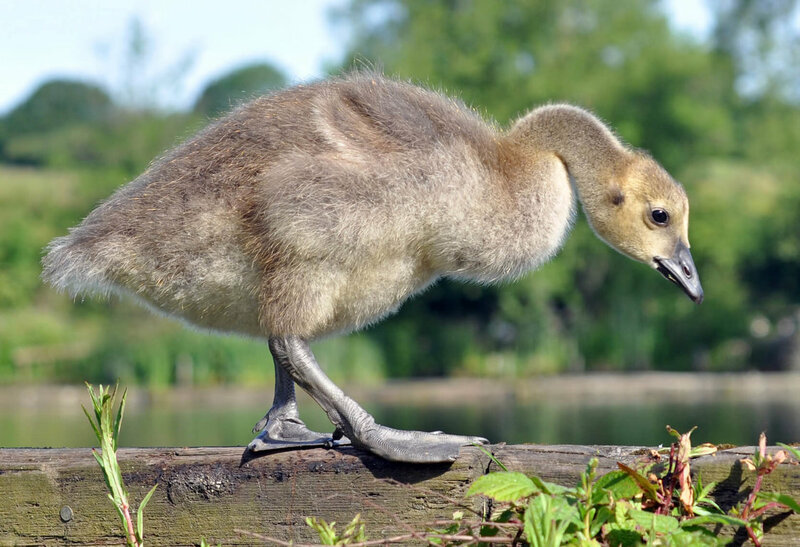 They honk loudly and can stretch their long necks out to great length when scared or threatened. Ducks and geese are wild animals, but they have domesticated counterparts who are raised for their eggs and meat, down and feathers. 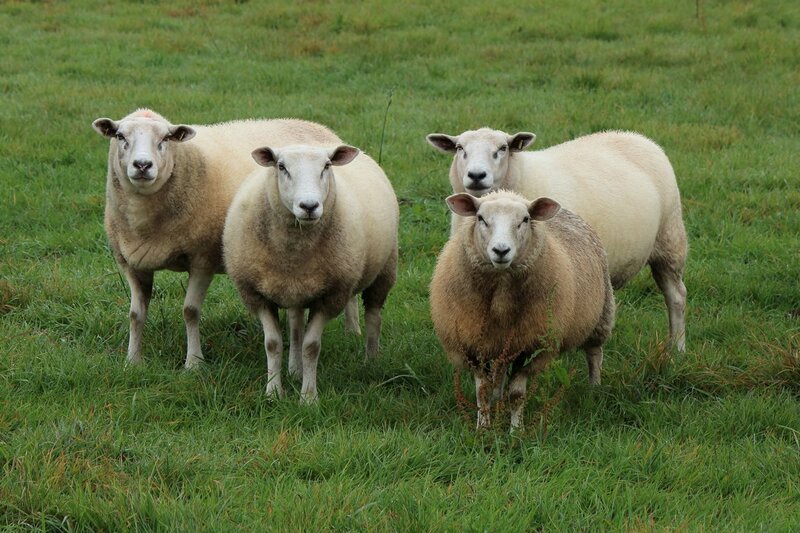 They're less commonly known as farm animals, yet they can certainly fall within this category. The veal calf industry is one of the most reprehensible of all the kinds of intensive animal agriculture. Male calves used for veal are taken from their mothers one or two days after birth. They are chained inside tiny crates barely larger than their bodies and are usually kept in darkness, except to be fed two or three times a day for 20 minutes. During their brief lives, they never see the sun or touch the earth. They never see or taste the grass. Their anemic bodies crave proper sustenance. Their muscles ache for freedom and exercise. They long for maternal care. About 14 weeks after their birth, they are slaughtered. The veal calf's permanent home is a veal crate, a restraining device that is so small (22 inches by 54 inches) that the calves cannot turn around. Designed to prevent movement (exercise), the crate does its job of atrophying the calves' muscles, thus producing tender "gourmet" veal. The calves often suffer from open sores caused by the constant rubbing against the crates. 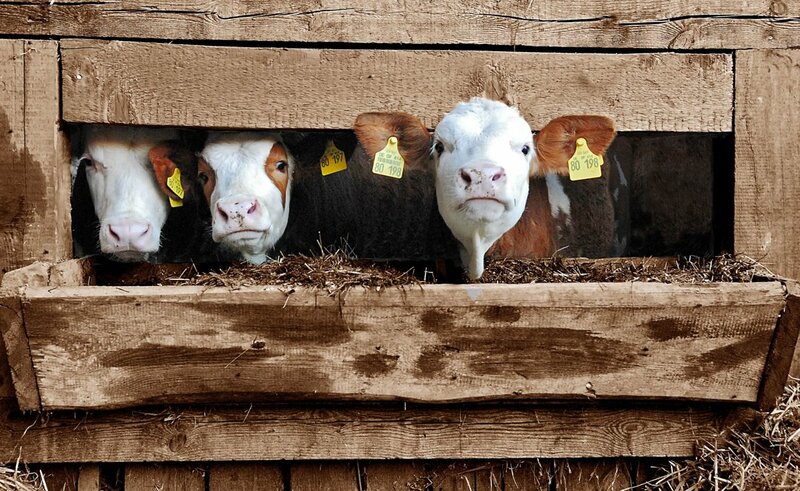 In 1996, the European Union voted to ban the veal crate across Europe. Yet it is still perfectly legal in the United States. The calves are generally fed a milk substitute intentionally lacking in iron and other essential nutrients. This diet keeps the animals anemic and creates the pale pink or white color considered desirable in veal. Craving iron, the calves lick urine-saturated slats and any metallic parts of their stalls. Farmers also withhold water from the animals, who, always thirsty, are driven to drink a large quantity of the high-fat liquid feed. Because of such extremely unhealthy living conditions and restricted diets, calves are susceptible to a long list of diseases, including chronic pneumonia and "scours," or constant diarrhea. Consequently, they must be given massive doses of antibiotics and other drugs just to keep them alive. The antibiotics are passed on to consumers in the meat and that's not all that's passed along. Federal agents have found more than a dozen veal production companies giving calves clenbuterol, a dangerous and illegal drug that speeds growth and increases anemia in the calves, producing more expensive white meat. Calves treated with clenbuterol can be sold for slaughter at 12 to 13 weeks, rather than the standard 16 weeks. Even trace amounts of clenbuterol can cause severe illness in humans, including increased heart rate, tremors, breathing difficulties, fever and even death. 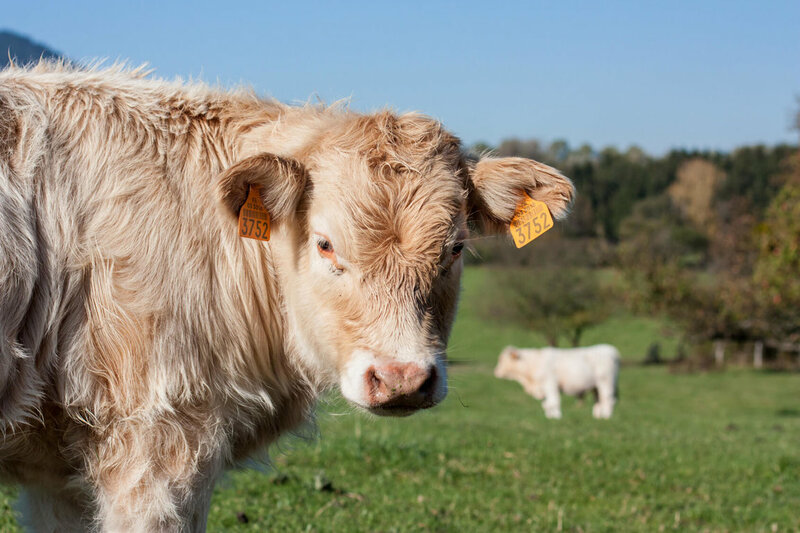 Veal calves are a byproduct of the dairy industry; they are produced by dairy cows, who are kept constantly pregnant to keep milk production high. Their female calves are raised to be living milk machines like their mothers...confined, fed synthetic hormones and antibiotics, artificially inseminated, and slaughtered after their milk production drops or they are slaughtered for the rennet in their stomachs (used to make commercial cheese). Since male calves cannot produce milk, they are often taken away from their mothers at 1 or 2 days old and put into crates to be killed for veal. The milk that nature meant for them ends up on our supermarket shelves instead. Factory farming is an extremely cruel method of raising animals, but its profitability makes it popular. Farm animals are sentient beings that experience all the same emotions we do. The best way to save animals from the misery of factory farming is to stop or reduce your consumption of meat, milk, cheese and eggs. Most Americans don’t know the true meaning of food labels like “cage-free,” “free-range,” or “grass fed” and falsely believe that farm animals are protected by laws or independent oversight, according to the results of a national survey released by the ASPCA® (The American Society for the Prevention of Cruelty to Animals®). The survey also showed that, despite their misconceptions, approximately three quarters of consumers surveyed are concerned about the welfare of animals raised for food and are paying more attention than they were five years ago to food labels that indicate how those animals were raised. There are now over 9 billion land animals raised for food in the U.S. each year, the vast majority of which exist in inhumane factory-like facilities. Sales of ‘higher-welfare’ animal ‘products’ are rising each year, demonstrating consumers’ ever-increasing desire for animals to be treated compassionately. But buying ‘higher-welfare’ animal products does not reduce animal exploitation. If consumers want to ensure that the food they buy is ‘cruelty-free’, by far the best way to achieve this is to buy vegan food. It is entirely possible and increasingly easy to have nutritious and tasty food and practical and stylish clothing without exploiting animals.